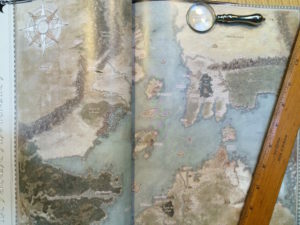 This post from 2011 showcases a number of different maps of Moorcock’s Young Kingdoms. Some of these appear in the novels (the Collier and Collier/Romanski versions). 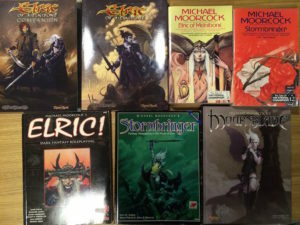 One is the “classic” William Church version from the Stormbringer RPG. Two are in French; I’m wondering if at least one comes from Oriflame’s French language editions of their Eternal Champion jeux des roles. For completeness, here are mine (photos rather than scans, sorry). Based on the Collier/Romanski map this one appears in my Eternal Champion omnibus editions, published by Millennium in the early 90s. I can’t see a scale anywhere. This is the one most role-players of a certain age will know. The smaller map in the back of the book puts one inch at 300 miles. This one appears in Elric! 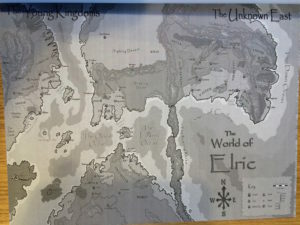 (which was later Stormbringer 5e, though I don’t know if it kept the same map). The scale (which you need a magnifying glass to see) is approx 500 miles to an inch. Not the prettiest map, suffering from both Mongoose’s horrible grey-on-grey printing and the Papyrus font, but it is the most complete — joining the “unknown East” with the better known area around the Oldest Ocean. Around 500 miles to an inch, which is the same as the others; but while this map covers a lot more area, there isn’t nearly as much margin padding so curiously the distances aren’t wildly different. French-only, full colour, with 500 km to just over half and inch (around 580 miles to the inch). Definitely the prettiest (which is consistent with the rest of that book). 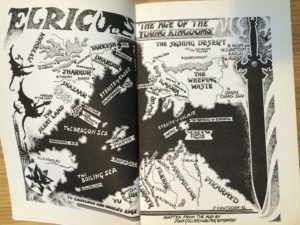 Stormbringer’s original map by William Church is “Authorised by Michael Moorcock”. 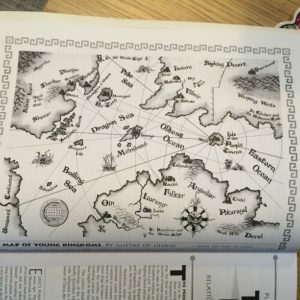 I assume the Collier/Romanski map is similarly authorised and pre-dates the RPG. I would also assume that Church wouldn’t deliberately contradict previous maps. In general the relative distances are roughly the same between different versions, as are the directions. Hawmgarl is north of Imyrr, Menii is to the east, Vilmiro is north-east. 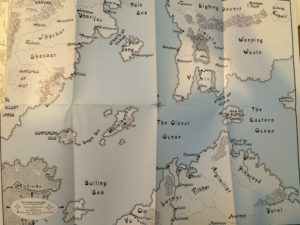 For more fun, when you measure the actual distances Church’s Stormbringer map puts the distance between Imyrr and Hawmgarl at 630 miles; Mongoose’s map puts it at 700 miles; Elric! at 870 miles; and Mournblade at 1280 miles. There are a few references to distance in the books, but I can’t remember them. But J. Cawthorn (and possibly Collier/Romanski before them) saw fit to just not bother with a map scale; and Moorcock almost certainly pulled the original distances out of thin air. It hardly matters, being fiction and all. I guess you might be concerned with distance if the Young Kingdoms world was a sphere and Imyrr was a certain distance from the equator and the weather varied. 700 miles is the distance between London and Marseille, where it’s warm enough to grow palm trees. Another 700 will get you to the North African coast. Cartographers lie anyway. It’s 925 miles from Chicago to Houston but it’s 4500 miles from Caracas to Buenos Aires; 1800 miles from London to Morocco but 7500 miles from Morocco to Cape Town. Not that you could tell from a Mercator projection. Are the Young Kingdoms cartographers telling the truth?